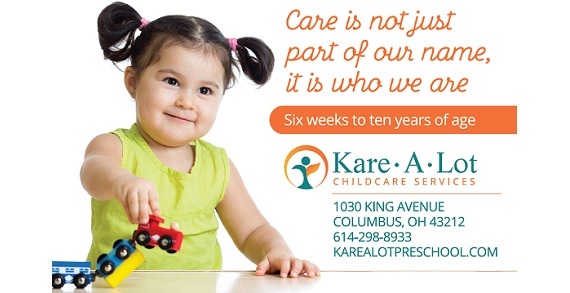 Since 1984, Kare-a-Lot has provided care and education to Columbus area families. Kare-a-Lot is a state licensed, independently owned and operated childcare center providing care for children 6 weeks through 9 years of age. Kare-a-Lot seeks to provide a quality home-like setting with emphasis on the individual interests and talents of each child. Hours of operation are Monday through Friday 7:00 a.m. to 6:00 p.m. and open year round. The 10,000+ square foot center provides an environment in which children’s cognitive, language, social-emotional and physical development is stimulated through various learning tools, education toys and gross motor equipment. Kare-a-Lot provides a balanced daily schedule of academics, physical activities and rest periods that are developmentally appropriate for each classroom. The philosophy is based on the fact that children are unique beings and should therefore be treated as individuals and not part of a group. Kare-a-Lot's goal is to get to know the children personally, discover their special talents and guide them in their development of a positive self image. To do this Kare-a-Lot provides small staff to child ratios and group sizes as well as trained, caring and committed teachers that work to ensure that every child has the opportunity to grow and develop to his/her maximum capacity.